Our mission is to provide advocacy and access services for autistic students that lead to successful academic outcomes while providing educational opportunities that increase self-knowledge in the areas of executive functioning, self-regulation, social interaction, self-advocacy, and career preparation; and to actively promote a campus and community wide environment of inclusion and understanding of students, faculty and staff with neurological differences. Watch this 1 minute video to hear more. 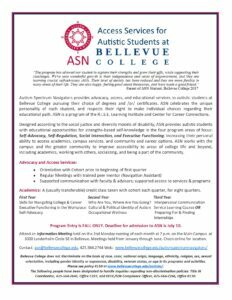 The Autism Spectrum Navigators (ASN) Program currently serves Bellevue College students who identify as autistic. Students must self-identify as autistic, must wish to be part of the ASN program, and must agree to participate in all program components listed above and discuss any participation concerns with program leads. See our Future Students page to learn more.